For other interesting demos for WebSockets, check out http://demo.kaazing.com for a few more demos, including using your iPhone as a joystick to control objects in a browser! Under Adobe Flash CS5/AIK2.0/bin, after executing ./adl ~/../../application.xml, I got this error: application descriptor not found. Thanks for the good presentation. 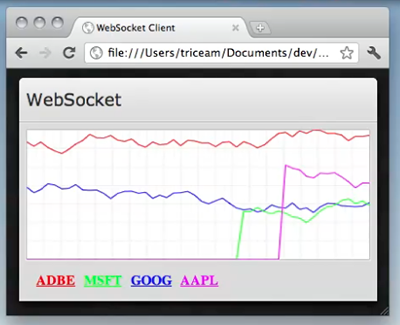 I would be interested in a websocket client sample implemented with AIR sockets and another one with Flash AS3 sockets. Do you please know some good samples of this kind ? AS3Websocket sample sounds more interesting since it allows SSL encryption. It also seems to be closer to the Websocket RFC.